Now that Barack Obama has won his bid for the White House, Americans should get ready to learn some inconvenient truths about him and the folks surrounding the president-elect that media have safely hidden from the public in order to promote his messiah-like image. First out of the gate were revelations about Rep. Rahm Emanuel (D-Ill.), the Obama supporter and Congressional Democratic Caucus chairman Obama has tapped to be his Chief of Staff (please see my colleague Jeff Poor's November 6 report on this subject). Hmmm. So, "The actions by Freddie Mac are cited by some economists as the beginning of the country's economic meltdown." 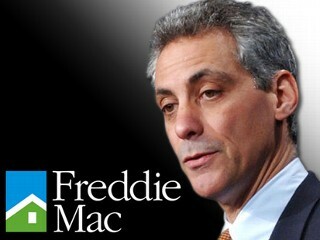 And "Freddie Mac substantially misrepresented its income to 'present investors with the image of a company that would continue to generate predictable and growing earnings'" while Rahm Emanuel, a leading figure in the Democrat Party who's supported Obama throughout his presidential campaign, was on the Board of Directors. And this is suddenly newsworthy NOW? Hmmm. Maybe next media members will report how Obama was the second-leading political recipient of Fannie Mae and Freddie Mac contributions since 1989 even though he's only been in Congress since 2005. After all, now such a revelation won't hurt him, although it certainly would have if fully disclosed by Obama-loving press members as the financial crisis came to a head in mid-September. Just imagine how differently things might have gone Tuesday if voters would have been completely apprised of Obama and his surrogate's connections to the government sponsored enterprises so responsible for the collapse of the banking and lending industries. As readers are likely aware, NewsBusters has for months made the case that if Americans knew just how tied to this crisis Democrats were, McCain would have easily won the White House, and the picture in both chambers of Congress would also be much different. Alas, the media were having none of that, and nicely hid the truth from a public mysteriously not interested in it anyway. In the end, it seems a metaphysical certitude that in the months to come, America's disgraceful media will begin to report things about Obama and his team that could have had a HUGE impact on the campaign if revealed months ago. I guess this is their way of soothing their guilty consciences, assuming any of these folks possess such a thing.